As the kids are starting a new school year, I thought these welcome messages in chalk on the sidewalk were interesting and hopeful. Everyone needs support when they are starting at a new place or doing something they haven't done before. Doing something new means opportunity for a fresh beginning and the chance to learn and grow, but it also presents changes and challenges. - What is exciting to them and playing up the positives of the new experience. - Encouraging people to make new friends to help make the adjustment. 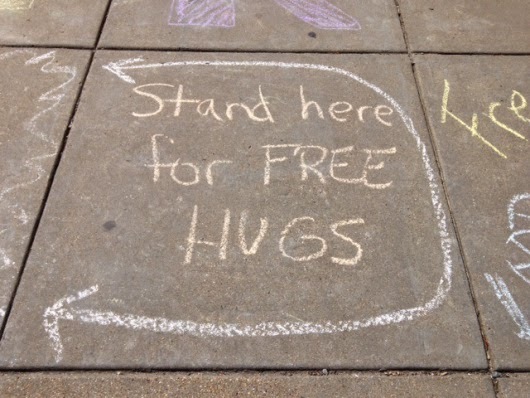 - Offer emotional support with "Free Hugs" and camaraderie. At times, we all end up in new situations and places. We may be looking for discovery, adventure, or a chance to do something different or perhaps change our fortunes. At other times, we may just get thrown into something and may not even be certain exactly how we got there. But either way, it definitely helps when we reach out to others and realize that while we are individuals, we are not alone as we go through it.